KID'S 2018 COOKING SUMMER CAMP BEGINS JUNE 4! MANY NEW MENUS FOR 2018! WE HAVE ADDED AN EXTRA HOUR OF FUN! MONDAY, July 17 and continue the next 3 weeks. that week's itinerary and to enroll. 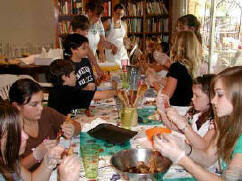 Our kid's summer cooking camps include full meals each day. Cost is $249 per week for the first child. We also offer the "Sibling Discount" to our returning campers.